You can buy this movie that this article is about from A/V Geeks on a DVD titled Yesterday’s Tomorrow Today. Hmm, I think I’ve heard that tag line somewhere… Paleo-future also posted it a few months ago. THE HOME OF THE FUTURE MAY WELL BE POWERED by a fuel cell, efficiently managed by a computer and most important to youâ€”provide electronics engineers and technicians with a large slice of a new multibillion dollar market. 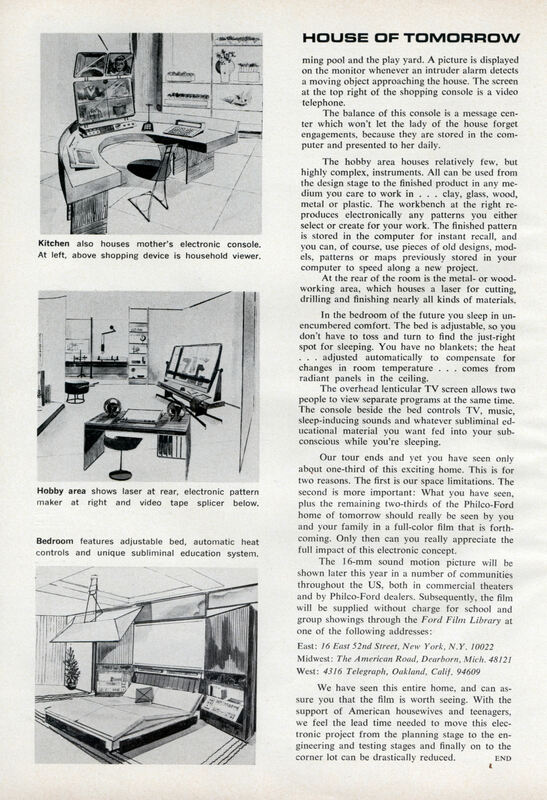 The Philco-Ford home of tomorrow shown and described here is part of a research project headed by George C. Crowley which actually crystallizes a great number of random ideas about the future of home environment and (significant for the electronic community) presents a total electronic concept. We would like to have you join us on a limited room-by-room tour of this exciting home. Then we’d like to make a suggestion on how to reduce the lead time needed to move this project from the planning stage into the construction and maintenance stageâ€”which is where the electronics industry should reap its largest benefits. Notice that the wall section is actually made of variable-opacity windows. These enable you to shut out the outdoors completely, or you can let filter through whatever amount of natural light you want. You can also adjust the color of the glass to match your furniture, your walls or your moodâ€”whatever pleases you at the moment. In the lower portion of the living room is a console which controls all entertainment and lighting functions throughout the home. You can have light of any intensity or color. The utility core is bound to be of tremendous interest to you since it houses the heart of the entire household system. At left is water heating and storage equipment. Next is the fuel cell, which produces all the electricity needed by the home. The cell is fueled by liquified gas from a storage tank buried under the house or a pipeline from a central community source. The fuel cell also provides absolutely pure water in more than adequate supply. In addition, heat from the cell is used to warm the home. All waste products from the house are incinerated by gas. In the center of the utility area there are two devices. At the top is the service monitor, at the bottom, the environmental control. Every few seconds, these monitors check the hundreds of electronic circuits required by this house. An electronic switchover inserts a backup circuit when trouble develops. They also are programed to alert either a local serviceman or your servicing agency automatically when maintenance is required or a breakdown occurs. The environmental control system analyzes the air in the home for impurities, odor, moisture content and temperature. The air is then filtered, warmed or cooled, moisture added or removed, and a pleasant odor (dial your choice) injected. At the right is the household computer, and it is used in an amazing variety of ways. The reels you see hold computer-memory tapes. They contain everything from the latest entry in your checking account to every page from every volume of your favorite encyclopedia. The computer is the heart of this house system and provides the cohesive element that maintains order in the daily functions of all its electronic devices. The utility core takes up only half of a hexagonal room. The outer half is devoted to a hobby area which we will take you through after we have looked at what is generally considered the woman’s domain. At the far left of the kitchen is a food processor. It is both a freezer and a microwave oven, and is computer-directed. Food from the freezer goes automatically to the oven at a preset time in specified quantities to be ready for serving at the dinner hour. The next unit, and one which seems to catch the fancy of most people, is a dishmaker. We foresee this development making its way into kitchens before very long. A simple machine using powdered plastic makes disposable dishware cheaply and quickly, eliminating both storage and washing of dishes. In another part of the kitchen is mother’s electronic console, and in the window area is her herb garden. The four panels at the bottom of the video screen are used for shopping. The housewife is placed in video contact with the store of her choice via microwave transmission. If she is shopping for food, the amount is determined by the computer. (If she wishes, she may even shop automatically: The computer’s record of house occupants’ weight determines the quantity of food ordered and the amount processed at mealtime.) The video shopper scansâ€”through a camera in the storeâ€”the shelves and counters the lady of the house selects. She orders by pushbutton. The store computer than totals the bill and sends it electronically to both her home computer and the bank’s computer. The bank computer debits her account and credits the amount to the store. Finally, the bank computer notifies the home computer of the new balance. At left, above the shopping device, is a household visual monitor. TV cameras continuously view such critical areas as the nursery, the swimming pool and the play yard. A picture is displayed on the monitor whenever an intruder alarm detects a moving object approaching the house. The screen at the top right of the shopping console is a video telephone. The balance of this console is a message center which won’t let the lady of the house forget engagements, because they are stored in the computer and presented to her daily. The hobby area houses relatively few, but highly complex, instruments. All can be used from the design stage to the finished product in any medium you care to work in . . . clay, glass, wood, metal or plastic. The workbench at the right reproduces electronically any patterns you either select or create for your work. The finished pattern is stored in the computer for instant recall, and you can, of course, use pieces of old designs, models, patterns or maps previously stored in your computer to speed along a new project. At the rear of the room is the metal or woodworking area, which houses a laser for cutting, drilling and finishing nearly all kinds of materials. In the bedroom of the future you sleep in unencumbered comfort. The bed is adjustable, so you don’t have to toss and turn to find the just-right spot for sleeping. You have no blankets; the heat . . . adjusted automatically to compensate for changes in room temperature . . . comes from radiant panels in the ceiling. The overhead lenticular TV screen allows two people to view separate programs at the same time. The console beside the bed controls TV, music, sleep-inducing sounds and whatever subliminal educational material you want fed into your subconscious while you’re sleeping. Our tour ends and yet you have seen only about one-third of this exciting home. This is for two reasons. The first is our space limitations. 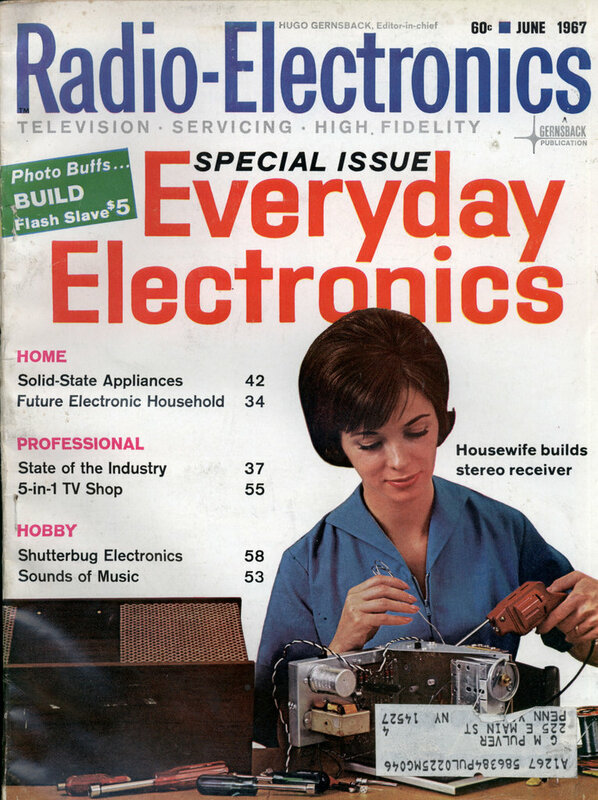 The second is more important: What you have seen, plus the remaining two-thirds of the Philco-Ford home of tomorrow should really be seen by you and your family in a full-color film that is forthcoming. Only then can you really appreciate the full impact of this electronic concept. They’ve stressed function over form so much that they’ve forgotten the importance of form. If items don’t appeal to the senses in the way people expect, those items simply won’t be used no matter how functional they appear. People don’t want their sofas and beds to be adjustable as much as they want them to be soft and comfortable, not hard and sleek as those seem to be. They don’t want their dishes to be disposable as much as they want them to be sturdy and attractive. They don’t want their food to be cooked efficiently as much as they want it tasty with proper texture. Even though some of the ideas could be adapted to a standard home, the package itself was bound to fail. People don’t want to be efficient at home: they want to be comfortable. This is about as uncomfortable as could be imagined. I guess the main reason it failed was that most technologies were simply not availiable back then. Back then video-tape splicing was done regularly by TV-stations. For consumers that never was an issue as a year later the first decent quality (think VHS) consumer VTRs came out which were so cheap (think car) that you could have afforded 2 if you put some money into your hobby. If course you had to buy your equipment in europe or japan. But hey, give ’em credit for getting so much stuff right. I hope the 2-ton computer is a metaphor for how much intelligence mankind can bring to problems facing us today.